The blood is an opaque, rather viscid fluid, of a bright red or scarlet colour when it flows from the arteries, of a dark red or purple colour when it flows from the veins. Blood consists of a faintly yellow fluid, the plasma or liquor sanguinis, in which are suspended numerous minute particles, the blood corpuscles, the majority of which are coloured and give to the blood its red tint. Blood is vital to life. It is the only component that nourishes each and every cell of our body. There is a certain limit of blood that every living body has to maintain and for human beings it is 6 quarts or 5.6 litres. During heavy bleeding much of our blood drained out of the body causing many complications and in worst it can cause death. To learn to recognize and manage victims of severe and minor bleeding enrol in St Mark James first aid and CPR training. Significant pressure is one of the best steps in aiding a victim with severe bleeding. 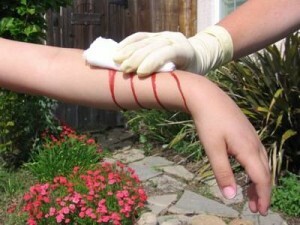 • Bleeding can be caused by injuries or can occur spontaneously. • Spontaneous bleeding is most commonly caused by problems with the joints or the gastrointestinal or urogenital tracts. First aid is appropriate for external bleeding. If bleeding is severe, or if shock or internal bleeding is suspected, get emergency help immediately. Basic training taught at St Mark James first aid and CPR programs teaches individuals the skills to manage patients with severe and minor external bleeding. Register for a course here. Basic principles, such as knowing to use an adhesive bandage or applying direct pressure on a bleed, are often acquired passively through life experiences. However, to provide effective, life-saving first aid interventions requires instruction and practical training. This is especially true where it relates to potentially fatal illnesses and injuries, such as those that require cardiopulmonary resuscitation (CPR); these procedures may be invasive, and carry a risk of further injury to the patient and the provider. As with any training, it is more useful if it occurs before an actual emergency.